It’d be impossible to completely go on resume headed into week two, otherwise teams who are thought of highly but didn’t play anyone notable would have to be ranked way lower, so there’s still a bit of bias from the preseason poll which will get weeded out more in the coming weeks. We didn’t get to see much from Stanford, so it’s tough to place where they should be when some others garnered heavyweight victories. The full dive into resume won’t come for a few weeks though, so the roster, talent and reputation of what Stanford can be this season keeps them at number one with their first test coming Friday at BYU. 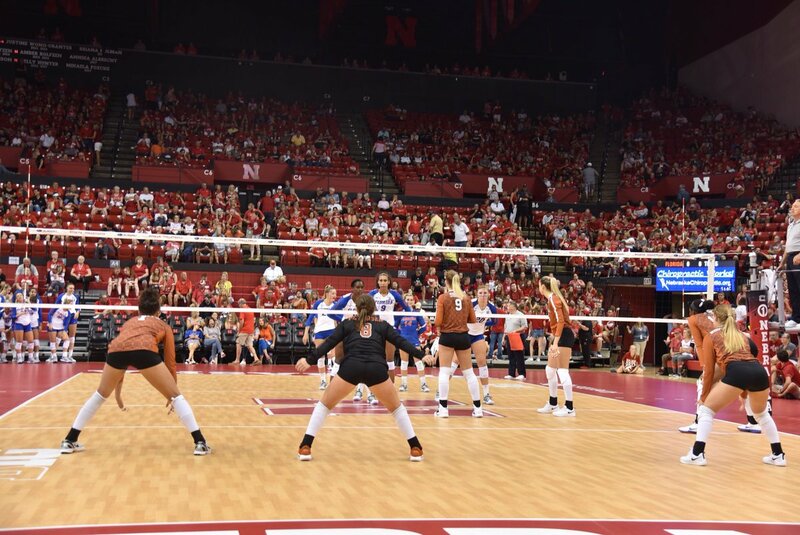 The Longhorns now have the best pair of wins in the country – albeit just one week. Their biggest questions of passing and serving showed up well as they swept Oregon and squeaked by Florida, which is enough for a raise on its own and adds to the highlight triumphs. The Gators were so close to downing Texas, and would have been ranked second and had a good argument for first had they owned wins over the Huskers and Horns. Still, winning at Nebraska and coming that close moves them up to three with another big week ahead. In the Big Ten/ACC Challenge, Minnesota looked solid. It wasn’t an overwhelming test, but they were potential NCAA Tournament teams in 2017, so it’s a strong start but without the resume wins of the teams that jumped them. The opener wasn’t quite what the Huskers hoped for in a title rematch, but it was a reminder that this team is very young and will get much better. They saw nice flashes at points, which were cemented against Oregon and now have an easier week to take another step forward. Wisconsin is another team who drops down a few spots just because the first week is very uneven in terms of what teams can prove with their schedule. They’re still a legit contender, it’s just that Florida and Texas deserved a big boost with their victories. While Texas might have the best two wins, no one can trump the three that USC put together in the opening weekend. They had some passing problems at times, but Khalia Lanier and Brooke Botkin are special pin players. The Trojans could be a top five team if they can down Florida this week. BYU is in the same group as Wisconsin and Minnesota. Dropping just for the time being because week one is our first data point and so big wins can cause jumping. They’ve got an opportunity to prove themselves against top-ranked Stanford at home. The Nittany Lions didn’t receive any true tests, but they also didn’t show any issues, which is a positive for such a young team. They’ll be a little more tested this week, but it’s next week’s schedule to keep an eye on. The Huskies earned a close victory over San Diego before a powerful sweep in the second meeting. They’ve got plenty of players filling bigger roles, but they’ve got talent to do so as seen in the opening week. Another test comes against a pair of Big Ten foes this week. The first test for Illinois was playing at a solid Colorado State team, and they passed. However, they didn’t look as strong and were almost upset by Northern Colorado, so this week will be big in figuring out where they fit in the rankings. Chaos could define UCLA’s first week after plans to go to Hawaii were derailed by a Hurricane. They ended up playing Gonzaga twice at home and weren’t dominant, but came away with victories over a top half level team in the WCC. This week will be their true test. The Bears showed out strong at home in the opener, downing a nearly ranked LSU squad and an underrated Marquette team. They’ve got more in front of them this week, but it was a good first step for Baylor to take as they try to be a dark horse Big 12 title contender in 2018. The Panthers were a giant killer in 2017 and look to have carried that over to 2018 with wins over Kentucky and Creighton. They were demoralizing to the opposition defensively with their floor defense, especially against Kentucky. Another tough week lies ahead though. The Bluejays were close to knocking off USC and rising even more in the ranks, but settling for a 1-2 week with the slate of opponents they saw isn’t too bad. Also, it obviously doesn’t count, but an exhibition victory over Kansas State – who looked good against Hawaii – technically happened. Week one wasn’t very good for Kentucky to say the least. On the bright side they were in every match and with some fixed can turn it around. An easier schedule this week should get their confidence back up, but even then all three teams are solid units. With all of their starters back, the Panthers have high hopes for 2018. They showed it well with a sweep of an underrated Pepperdine squad and ranked win over Cal Poly. They’ll need Stephanie Williams to return from injury down the road, but as for now Pitt is a threat to host in the NCAA Tournament. Oregon had all kinds of setting troubles in week one. Still, they played two extremely high-level opponents so it’s tough to judge how much the losses mean. They still have plenty of talent on the roster with several top-notch recruiting classes converging into 2018. It was a clean opening week for the Wolverines against a 2017 NCAA Tournament team and an SEC foe. Still, neither jumps off the page and their first true tests won’t come until September 7 and 8 against LSU and Colorado State, respectively. The Buffaloes were without Naghede Abu, who was top 30 in the country in blocks last season and suffered an upset loss at Wyoming. They’ve got some problems to overcome with some youth, but can lean on last season’s late run to know that the early portion can be as much about learning as anything else. It wasn’t the most difficult of stretches to open the season for Purdue, but with some players either stepping up into new or bigger roles, the Boilermakers won every set. Notre Dame should be a solid challenge this week. The Toreros have a rough non-conference that continues this week, so the record might not indicate how good they can be. Their first match against Washington could be a perfect example, as they lost but kept things close and competitive. The Golden Eagles did lose to Baylor, but were very impressive in their other two matches and even gave the Bears strong competition. They’ll continue to stick around near or in the top 25 as a threat to Creighton’s Big East title reign. The Cougars block was alive and well and Taylor Mims continued to shine as the Cougars eek into the early Top 25 with a big showdown in Cedar Falls ahead. The Van Windens put up big numbers in week one, but the Mustangs fell short against ACC favorite Pittsburgh. Still, they have a couple of chances to earn big non-conference wins ahead with UCLA (twice) and Wichita State coming later in the schedule.